Visualizing a scene and making a photograph is barely half the work of creating a physical piece of art. The scene must be carefully processed to provide the best rendition according to the photographer's vision for that piece. Then, the photograph must be prepared for printing and mounting. After considering and working with several print houses over the past few years, Jon Berndt Photography has partnered with Reed Art & Imaging here in Denver to provide the highest quality prints in many different formats. I was personally given a tour of Reed's facility in Denver by the owner, Bob Reed, and I was very impressed with the history of their business, their capabilities, and most importantly their commitment to high quality prints as evidenced by samples of their production work on display. There are many mounting and display formats that I offer my prints in, and those are described below. If you have specific needs, please contact me to discuss options - there are always options! Fine Art Hahnemühle Baryta is a paper that sets the benchmark for high color depth, large color gamut and image definition. This paper gives the “wow” factor particularly to black and white prints (such as my print at left) with extremely high density and finest grey tones. This paper provides the pigment print artist with a medium that looks and feels very close to old-school fibre black and white papers. Baryta is a bright white, 100% α-cellulose paper – guarantees archival standards. With its premium high-gloss baryta (bromide) coating, Fine Art Hahnemühle Baryta meets the highest industry standards of density, color gamut, color graduation and image sharpness while preserving the special touch and feel of genuine art paper. For extended print longevity, Canon Lucia Pigmented Inks are used. Prints can be made on photo gloss and mat surface papers. These are also made using Canon Lucia pigmented inks for extended print longevity. LightJet Photo C-Prints use Fuji Crystal Archive professional digital chromogenic gloss, luster, and semi-matte surface papers. The LightJet is the top of the class of large format digital photo printers; LightJets are considered to be the finest quality photographic printers available today. This digital technology provides the best possible photo printing with edge to edge sharpness that no other photographic large format printer can achieve. The Gallery Collection is a photo mounting process designed to enhance and protect any type of flat graphical display – art prints, photographs, posters, maps, awards, renderings, certificates, and documents. This high quality process provides a distinctive new look that is durable, glass-less and offers a greater degree of protection from moisture and harmful UV rays than some traditional photo framing ideas. Our Gallery Collection is fast becoming the preferred presentation styles for professionals, curators and enthusiasts, due to the increased durability, non-glare waterproof surfaces, variety of colors and styles, and resistance to harmful UV exposure in all standard viewing areas. Mounted artwork will stand out as a focal point in any room, free of the distraction of a frame and old-school mat. The entire Gallery Collection line-up has been carefully designed to look great in most any room and under most any lighting conditions. All Gallery Collection photo mounting products come ready-to-hang with their completed hanging systems and hardware. Truly a creative way to hang photos. 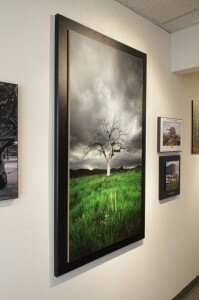 Greater Value – Gallery Mount offers a high-end look in a quality product at reasonable prices. Stylish and Contemporary – A selection of four photo mounting styles, 20+ edge colors, and approximately 900 optional “Color Mat” colors means there is a perfect Gallery Mount to complement any graphic and room decor combination. Clean Crisp Image – Our glass-free photo framing system provides a glare-free finish, and the UV protective layer in the durable protective laminate minimizes fading better than conventional glass. Images and colors appear clearer, sharper and brighter. As there is no glare, images and type seem to pop out at you at all angles of view. Safe and Practical – There is no breakable glass. Gallery Mount is a safe and practical photo mounting option for high traffic areas such as offices, children’s rooms, homes, schools, restaurants, lounges, recreation and work areas. The easy to clean surface on the Gallery Flat, Gallery Float and Gallery Box mounts are touchable and completely washable—grease, dust, dirt and moisture wipe right off with regular household glass cleaner! Perfect for the less than ideal environments too, such as kitchens and bathrooms. The Gallery Clear has an amazing optically clear surface that really lets your image “Pop” This delicate surface requires special handling and cleaning to keep it looking pristine. We clean ours using lens cleaner (like you would buy from the optometrist) and a clean, dry microfiber cloth. Any strong cleaners containing ammonia or detergents, or rough cloths or aggressive handling can damage the delicate optical surface. Expertly Crafted – Prints are professionally photo mounted on High grade acrylic, aluminum clad panels or MDF with carefully formulated cold-press adhesive and topped with a UV protective laminate when applicable. Ready to Hang – All Gallery Mount presentations come ready to hang with the hardware. Eco Friendly – Premium MDF is used with a Composite Panel Association (CPA) certification of 100% recycled/recovered fiber in compliance with their Environmentally Preferable Product (EPP) specification CPA 3-08. Pieces will stand out on this clean and modern presentation and it’s visual impact will be greater than traditional photo framing. The image is printed on Fuji Crystal Archive paper for longevity. It is then spot mounted on brushed aluminum (butler finish) composite panel and floated from the wall with a lightweight but durable box cleat that provides an attention-grabbing yet tasteful drop shadow. Acrylic Prints provide the extra smooth and extra pop that are all visual benefits you will see with the Gallery Clear Acrylic Print. This is the premier presentation system for bringing detail, color and tonal range to life in a way that traditional photo framing cannot. Prints are made exclusively on Fuji Flex polyester photographic material for amazing color and longevity (black and white images also look fantastic on this material). Face Mounted on optically clear high-end 1/4″ acrylic mount, the edges are hand polished for a crystal clear look. The Gallery Clear is a top of the line face mount to acrylic plex and it comes standard with hand polished edges, square corners and the box cleat hanging system for stability. We then add a 1/8″ backer made of Aluminum Composite Material (ACM) that is either flush mounted to the edges of the plex or inset for a thinner profile. The contemporary look of this photo mounting presentation method is ideal for artwork and images that really pop. The Gallery Clear will look great against most any wall type, but with the ultra glossy surface, hanging your Gallery Clear acrylic face mount directly across from a bright window is not recommended. Gallery flats come with keyhole mounting systems. All of our Gallery Mount presentations come ready to hang. Prints are professionally photo mounted on MDF with carefully formulated cold-press adhesive and topped with a UV protective laminate when applicable. Canvas gallery wrap edge detail. Canvas gallery wrap back detail. An elegant way to present photographs is with canvas prints as a gallery wrap. Canvas prints are sprayed with a protective UV coating to increase their longevity when displayed. Gallery wraps are an easy and ready to hang framing option. A “Gallery Wrap” is a method of stretching a canvas print so that the print wraps around the sides of a frame called stretcher bars. The gallery wraps are then created by securing the canvas prints to the back of wooden frames in the traditional way using staples. This method of stretching and preparing canvas prints does not need an expensive decorative art frame, though one can certainly be added if desired. Gallery wraps are hand stretched by craftsmen - not machines - for a look that feels natural. Photos on canvas gallery wraps look amazing. Add a rich new look to photographs. Wildlife printed as fine art photos on canvas add an authentic and classic feel that enhances the viewer experience. Using world-renowned inks and the honed eyes of Master Printers, artwork is first printed on a high-resolution transfer medium. It is then placed in careful registration against a coated aluminum sheet scientifically engineered for maximum image performance and longevity. Using precisely determined temperatures, calibrated machine speeds and attention to detail, the image and aluminum receiver are heated – swelling the special coating while evaporating the inks. The thirsty coating absorbs the printing dyes and hardens as it cools – locking the image into the protective barrier. Metal prints are known for their wide gamut allowing for very saturated colors.